Swim with the whales… and Spock! Commemorate the memorable scene from Star Trek IV: The Voyage Home. 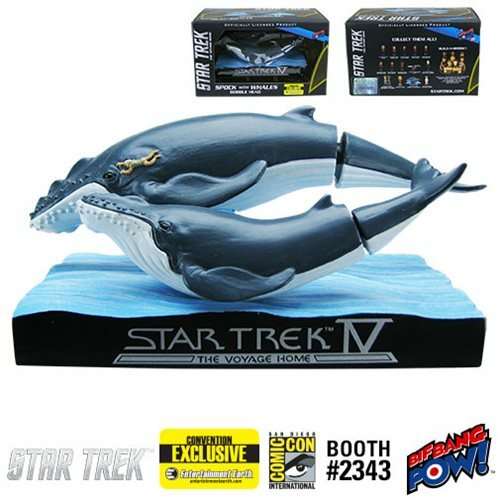 Unique resin bobble collectible of Spock swimming with whales! Entertainment Earth Convention Exclusive! If you never get the chance to swim with the whales, at least you can bobble with them. Presenting the only logical way to fit humpback whales in your collection this Star Trek IV: Whales with Spock bobble head made by Bif Bang Pow!. This Entertainment Earth Convention Exclusive measures approximately 2.5” tall x 4.5” wide x 2.75” deep. The finely detailed collectible shows a pint-sized Spock swimming with two humpback whales as featured in the motion picture, Star Trek IV: The Voyage Home. What makes this bobble so unique is the fact the tail of each whale bobbles instead of the head. And, making it a true collectible, the run will be limited to just 1,998 convention-exclusive pieces, each individually numbered. Ages 14 and up.